What does welding have to do with robots? A lot, actually. Robots have revolutionized the manufacturing industry, reducing costs and boosting productivity. Many popular welding processes can now be automated. But contrary to popular belief, robots are not stealing jobs. Instead, they’ve created high-tech positions for welders in important fields like auto manufacturing, in which robotic welder operators supervise and maintain automated welding equipment. Robotic welding is a field that pairs welding with computer science to create manufactured goods ranging from car parts to ornate metallic furniture. Robots can position and secure the parts to be fused and may also perform the welding. The two welding processes that are most frequently semi or fully automated are spot welding and arc welding. In spot welding, the two workpieces are placed next to each other. Then an electrode is used to fuse them. In arc welding, a metal arm serves as the arc, which employs wire electrodes to join the metals. A shielding gas is also used. Computers typically control robotic welding systems. What Does a Robotic Welder Operator Do? Programming the computers that direct robotic welding equipment is perhaps a robotic welder operator’s most important job,but what else do they do? 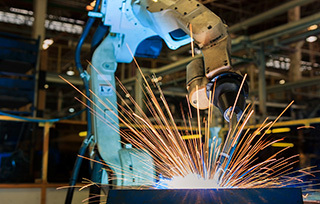 Since the job combines the fields of welding and robotic manufacturing, a typical day could have you performing some or all of the above tasks. If you’re enrolled in a welding training program or are already employed as a welder, you can take robotic welding classes to get your skills up to speed. Once you have some work experience, earning welding industry certifications can show potential employers you can get the job done up to code. Basic welding training at a trade school can improve your chances of landing an entry-level welding job. Positions that involve programming robotic manufacturing equipment usually require vocational training, too. Another option is to take a short training session with a company that sells robotic welding systems. Starting with a basic welding program and then taking some courses in robotic welding is one path you could take to this career. Welding certifications are a great way to show potential employers that you’ve got the right skills for the job and are current with industry standards. Three or more years of experience in a job that has a direct relationship to welding or robotics. Technical training at a welding school can take the place of up to two years of welding experience. AWS also recommends that robotic welding operators complete an original equipment manufacturer’s robotic programming course. After meeting these requirements, you can take the Robotic Arc Welding exam. The test includes both a practical test and a written one. It’s not uncommon for welders to add robotic equipment operation to their skillset and then advance to higher positions in this field. Matt Zeigler was an arc welder who worked 12-hour shifts at a forklift-manufacturing firm. When he saw a technician come to operate the company’s new robotic welding machine, he was inspired to do the same. He learned the necessary skills and climbed his way up to a top robot programming position at Motoman, an industrial robot manufacturer. Zeigler now handles a number of job duties, including calibrating the welding robots’ moving parts, handling engineering work, installing Motoman robotic welding machines at client companies and pitching products for sale to potential buyers. Robotic welding is a growing field, accounting for 20 percent of all welding performed in the U.S. If you’re interested in this career path, taking welding classes can be a first step. Trade schools offer streamlined welding programs that can help teach you the trade in just seven months. Learn more about the benefits of trade school.